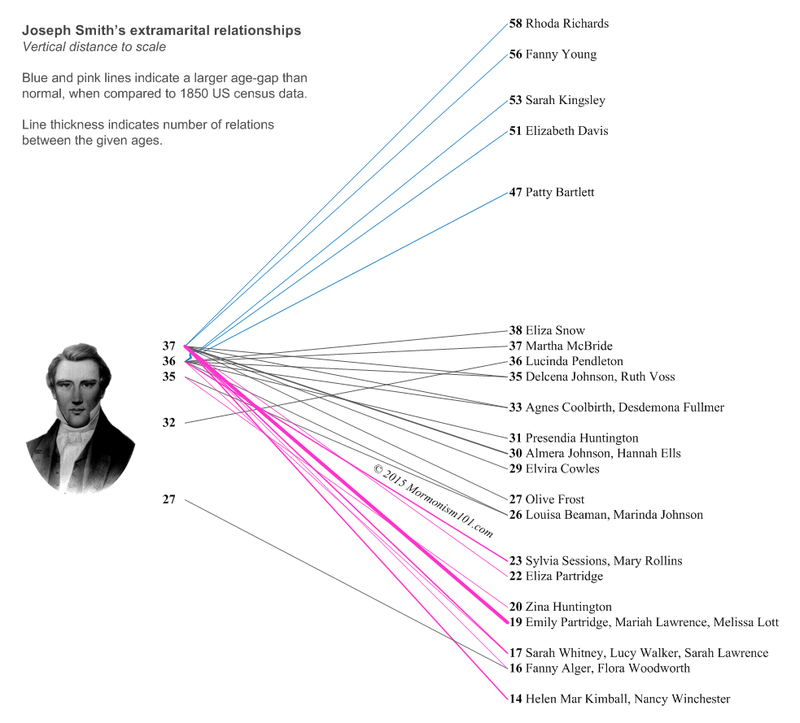 The slopegraph below shows the ages of Joseph Smith (left) and the girls and women with whom he entered into extramarital relationships, commonly referred to as polygamous marriages. What does this chart illustrate? The first “category” to catch the eye are the five older women in the top right corner. Some of these marriages probably were attempts to forge dynastic bonds between Joseph Smith and other prominent Mormon families. There is also an opportunistic element, marrying the prophet to increase one’s standing in the afterlife. Others, however, served a more sinister purpose. These women were called “Mothers in Israel” and were actively involved in recruiting the younger women and girls for plural marriage. After these women had entered the secret inner circle of Nauvoo polygamists, the ratio of very young brides to Joseph Smith rose from one third to about half. Within 14 months, their average age had dropped from 20.5 to 17.4 years. Today, this practice is called “grooming”, a criminal offense associated with child abuse and the trafficking of women. It is also endemic to modern Mormon polygamous groups. While these practices are rightfully abhorred by mainstream Mormons today, they are nonetheless part of the heritage of Joseph Smith’s polygamy. About a third of these women were much younger than was normal in Joseph Smith’s time and place. On the slopegraph, this is represented by the pink lines. Census data from 1850 shows that not even ten percent of the surveyed teenage girls were married. The ones that were, had mostly married boys and men their own age, or a few years older. Two more relationships visually stand out on the slopegraph: the ones with Fanny Alger and Lucinda Pendleton. Given the absence of the context of Joseph Smith’s later polygamous unions, it is likely that these were adulterous affairs rather than marriages (though Mormon apologists disagree with this assessment). These relations reveal another disturbing tendency of Joseph Smith: to become involved with whatever girl or woman happened to live in the same household. Joseph Smith’s behaviour was illegal and deviant, not only “through the colored glasses of the 21st century” but by the standards of his own environment as well. When his activities were about to be brought to light, justice came swiftly and mercilessly – also in keeping with the mores of his day. Given the speed of the developments at Nauvoo, his murder may well have been the only thing that prevented him from becoming the Warren Jeffs of his day, instead granting him the status of a religious martyr in the eyes of his present-day followers.